Product prices and availability are accurate as of 2019-04-20 00:26:39 UTC and are subject to change. Any price and availability information displayed on http://www.amazon.co.uk/ at the time of purchase will apply to the purchase of this product. 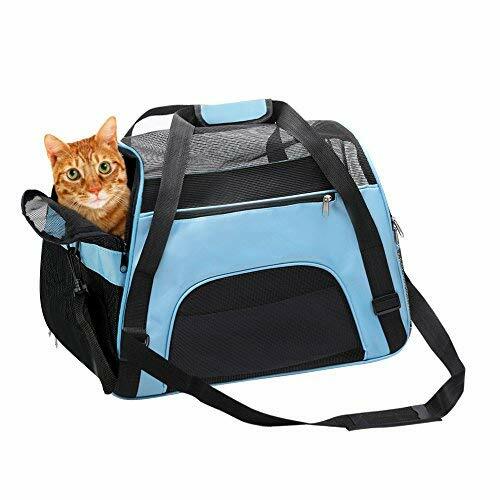 The pet carrier bag is made of durable, lightweight and waterproof materials. It is compliant with most airlines. Designed with mesh panels for most ventilation. And there is a hard board inside that is removable for support and it is easy to clean. - Mesh ventilation on sides and top not only provide adequate airflow, but also easy viewing--perfect for your pet to look out and for you to check on your pet. - It comes with auto-lock zipper sliders and a tether which will prevent your pets from escape. 2. Pets should not be left unattended in this carrier. 3. When traveling in a car, be sure to secure the carrier to the seat of car by seatbelt only. 4.Please contact with airline before flying with your pet to avoid needless trouble and affect your trip.